The Form No. UC-700 Unemployment Compensation is an unemployment law poster by the Pennsylvania Department Of Labor & Industry. This is a mandatory posting for all employers in Pennsylvania, and businesses who fail to comply may be subject to fines or sanctions. This poster must be posted in a conspicuous place where all employees can see it. This poster discusses the requirements and how to apply for Unemployment Compensation. It appears you don't have a PDF plugin for this browser. Please see the link below to download pennsylvania-uc-700.pdf. Apply for Unemployment Compensation (UC) Benefits. hours are reduced. You may risk losing some benefit eligibility if you file after the first week you are unemployed. 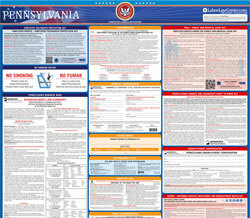 www.uc.pa.gov, or by calling the UC Service Center at 888-313-7284. TTY: (Hearing Impaired) at 888-334-4046.
restitution and loss of future benefits.